Bing Bunny is Chunk's favourite programme at the moment, to the extent that we have to watch at least ten episodes per day or he has major tantrums. It's literally his OBSESSION. 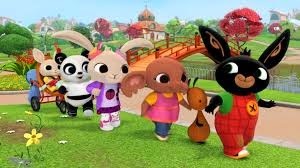 As programmes go though I don't mind, because Bing has taught me quite a lot about parenting which is something I never thought I would be saying about a toddler's programme! Each episode is only about five minutes, but they seem to cover so many relevant things, such as behaviour, tantrums, loss, potty training, games and so much more. Flop is the carer of Bing and he is who has really helped me most. Just watching the way he deals with Bing's tantrums or times of sadness has shown me so many more techniques that I can use with Chunk. It's also shown me some of the things I have been doing not so well at all and made me take a long hard look at my parenting, and I'm thankful for this. Flop never seems to get angry and he has great ways of calming Bing down, from distraction to reassurance and just being gentle and calm. In the heat of the moment I can find it so hard to keep my cool, but seeing how it can help has really hit home. I also love that my son and nephew are hooked to this programme and it teaches them really positive things. Chunk has learnt what shadows are and plays games with his, he likes to help tidy up more because Bing plays funny games with the hoover that eats all the leftovers on the floor, and he has learnt a lot of new words through the programme. It's also inspired me for things to do with Chunk when I am stuck, such as chalking pictures outside on the pavement, making our own bubbles and having a goodbye box for broken toys that cannot be fixed. Now this isn't an advert for the programme, please don't roll your eyes, I am just genuinely quite surprised at how much both Chunk and I are getting from a five minute cartoon! 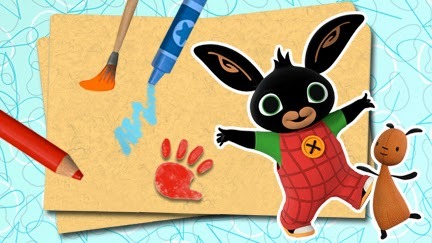 The characters are brilliant, from the little toddler Pando who is always just in his pants as he hates wearing trousers, to the typical inquisitive and hater of losing Bing Bunny. Do you know any children's programmes that have inspired you or been great for your kids?